Troposphere: the lowest portion of Earth's atmosphere, and is also where nearly all weather takes place. It contains approximately 75% of the atmosphere's mass and 99% of the total mass of water vapor and aerosols. The average depths of the troposphere are 20 km (12 mi) in the tropics, 17 km (11 mi) in the mid latitudes, and 7 km (4.3 mi) in the polar regions in winter. The lowest part of the troposphere, where friction with the Earth's surface influences air flow, is the planetary boundary layer. This layer is typically a few hundred meters to 2 km (1.2 mi) deep depending on the landform and time of day. 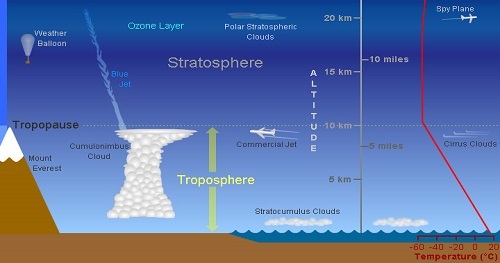 Atop the troposphere is the tropopause, which is the border between the troposphere and stratosphere. The tropopause is an inversion layer, where the air temperature ceases to decrease with height and remains constant through its thickness. There are currently no items matching "Troposphere".